Six degrees of separation are totally unnecessary when you live below the falls. You grew up here? Yes, I did. Did you go to Lew-Port? I sure did. When did you graduate? 1976. Oh wow, what’s your maiden name? It’s Russo. My father owned several car dealerships. Oh cool! I went to school with your brother Joe. And I think my brother went to school with your sister Carolyn. You did? That’s great. And once that connection is made you are really not new anymore. Casey’s is new to me, but not new to Ransomville. They opened up in 2006 in a building which was built on the site of a general store that burned down in the early 1900’s by G.E. Hubble for C.E. Cornell. A new grocery store was built on the site in 1919 by R.A. Neumann. The original plank wood floor gives this place an old world feel and the furniture is an eclectic combination of old, older and not so old. Somehow it all works. Casey’s Malt Shoppe makes a wonderful first impression even before you walk in the door. I love the big bottle of ketchup on the window. The awning is red and white striped and 1940’s and 1950’s music greets you as you enter. It certainly adds to the ambiance. As “regular” customers come and go, they kibitz with the folks here like they come here every day. And, to no surprise, they do. It’s a typical local gem where everybody knows your name. Among this morning’s breakfast specials are grilled Polish sausage with two eggs and toast for $4.25, a 6-ounce steak with two eggs and toast for $5.99 (wow – what a price!) 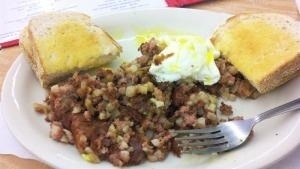 and corned beef hash for $3.89. Karen Fellows has been here since day one (makes sense since she is the co-owner). She was my server (one of her wait staff was delayed) and all around Casey’s guru and was ready to announce the breakfast specials but I had my eye focused on corned beef hash and eggs. To me that is the ultimate treat. Soggy hash is awful and I am happy to say the hash was cooked crisp, I assume on a very hot flat-top grill. My eggs, over easy, were cooked perfectly. It looked and smelled so good I forgot to take a picture until I was already well into my generous portions. Kim Lee, originally from Mississippi, the cook, has been here for three weeks. She has never been a line cook before. She loves the people and the owners. And, she made me the best hash I have had in a while. Why did Karen get into the business? She did not have a job and did not want to drive to Buffalo. It started as an ice cream shop and when ice cream didn’t sell they turned it into a diner. 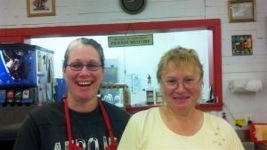 Karen tells me she thinks she has a successful business because it is simply based on good food. I asked her how many hours a week she is here and she said 30 hours at the restaurant, she does the shopping twice a week and does the books at home. There is very little glamour in this business, that’s for sure. She told me about a great Friday fish fry and her homemade New England clam chowder. Service is fast. Meatloaf Monday is famous for a meal that reminds her of her mom’s. They serve beer and local wine. The lunch and dinner menu is filled with burgers, chicken sandwiches and hot dogs. They have a BLT on their menu so I already know what I will order when I come by next time. And, I’ll bet they remember my name. ← When Being Under Pressure is a Good Thing!